Sixty-eight percent of U.S. households own a pet, according to the 2017-2018 National Pet Owners Survey. And many of those homes also have children. In fact, parenting experts recommend pet ownership for families. Caring for animals helps children learn responsibility, empathy and compassion—along with increasing their activity level and reducing stress. In cities and towns, dogs and cats are the norm, with much smaller percentages of families owning fish, birds, reptiles, hamsters, etc. On farms, however, children have the opportunity to help raise other animals as well. Chris and Kristi Effling raise cattle on their ranch/farm near Highmore, S.D. 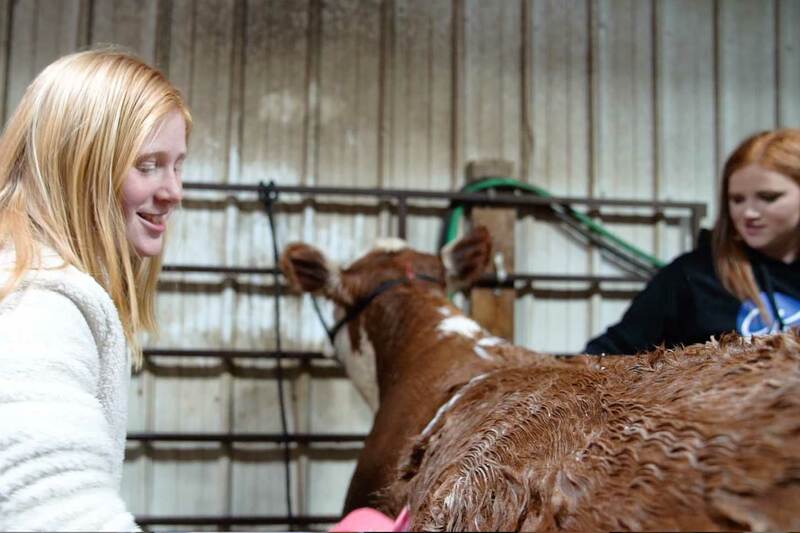 Their three daughters show cattle and pigs at local, regional and national livestock shows—and they’re very successful! Every win is a result of months of hard work. The girls spend hours daily caring for their show animals. But caring for show animals isn’t just a summer job. The girls pamper and train heifers and pigs year round. “Every night we’ll work with our cattle out on the lawn or in the pen,” she continues. Training animals for the show ring involves walking, standing and moving correctly. Are show animals similar to pets? In some respects, show animals are very much like pets. “These kids have a bond with them,” says Kristi. “My pigs this year, they’re like pets. They’re kind of like dogs to me. I’ll hang out with them in the pen and pet on them, and they have this squeaky toy that they have in their pen that they like to play with. So I mean, it varies from their personality, but there are definitely some that basically are pets,” she says. Kristi and Chris feel that showing animals has been excellent for their daughters. Showing animals is beneficial in other ways as well. Cagney, the Effling’s oldest daughter, went to college with a livestock judging scholarship. All three girls have traveled widely as part of showing, as well. Because the Efflings are active farmers/ranchers, Kristi is sensitive to criticism from people who may not have experience raising livestock. “I don’t know any farmer, rancher, livestock person that doesn’t do what they feel is in the best interest of the animals when they’re taking care of them,” she says. For the Efflings, like many farm and ranch families—and many nonfarm families statewide—caring for animals is part of their everyday lives. It teaches important life lessons and provides opportunities for children to learn, grow, form relationships and enjoy family time.